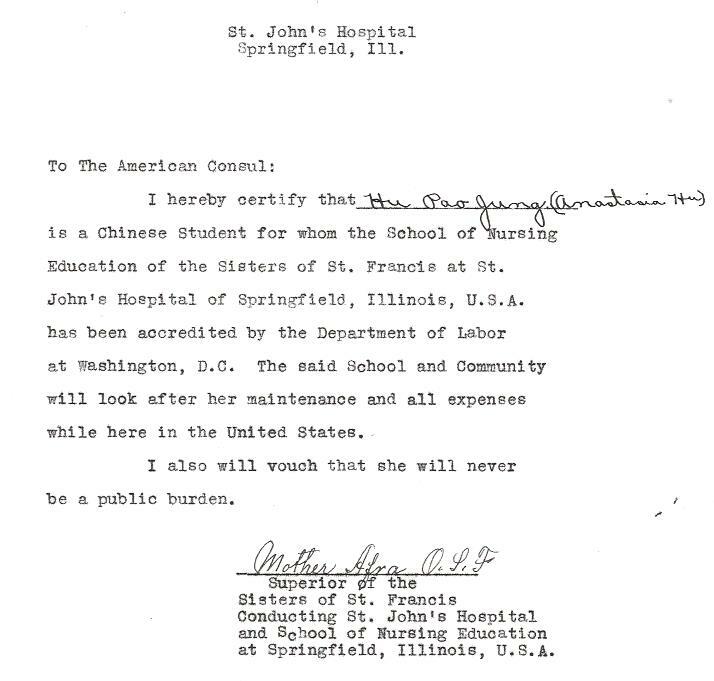 Anastasia Hu (Hu Pao Jung) (Sister Claudine), Section 6 Student, received a non-quota immigration visa to attend a 4-year course of study at St. John’s Training School for Nurses, St. John’s Hospital, Springfield, Illinois. Anastasia Hu was born in P’ingyin, Shantung, China and attended the Franciscan Mission School in P’ingyin and St. Joseph’s Hospital in Tsinan in preparation for nursing school. Several other young Chinese women arrive with Anastasia to attend nursing school at St. John’s Hospital in Springfield: Clara Chi (7028/227), Mary Chang (7028/28), Anna Ting (7028/230), Agnes Wang (7028/231). Anastasia Hu arrived in Seattle on 22 June 1932 and returned to China on 19 October 1936 after completing nursing school. Anastasia Hu, Letter to American Consul, 28 January 1932, RG 85, National Archives-Seattle, Case file 7028/229.